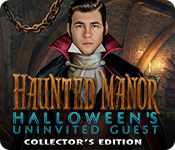 Haunted Manor: Halloween's Uninvited Guest Collector's Edition is rated 3.2 out of 5 by 43. Rated 5 out of 5 by yilinlai from Fabulous!!! Have always been a timid person and would never touched any HO with the word 'haunted' in it~ But looking at the description, I thought I would give it a try. Eipix have never failed to disappoint me, I loved the graphics and the storyline! I thought its going to be like a ghost for revenge but it wasn't, which was something original for me. The spooky lovers out there might not love it as much, but for me, it was just perfect. The first halloween game that I ever played and loved! Rated 5 out of 5 by writingislifels from Fantastic! Loved this total Halloween in a haunted castle complete with awesome puzzles, and mystery, definitely a winner! Rated 5 out of 5 by cdhawki1 from Pleasantly surprised! I was pleasantly surprised after a few scenes of this game. At first I had to agree with some of the bad reviews until I got further on down the game. It turned out to be a darn good game after all!! So, once again, I am reminded not to pay attention to all the negativity I read on some of the games, or play the free portion and find out for sure what the game is about. I enjoyed the game after all...you will too if you give it a chance!! Rated 5 out of 5 by Penguin29 from Glad I accepted the invitation! Well, I see from the reviews either you love this game or hate it. I LOVED it.. one of the best games I've played in a while. 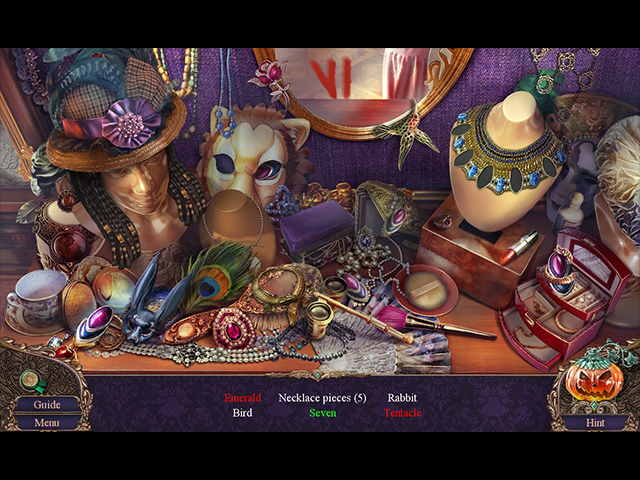 The hidden object scenes have some new twists I've never seen before - Thanks for that. I say give it a try. Rated 5 out of 5 by Foster321 from A very enjoyable Halloween game This is a well done game. Very colorful and decorated just right for Halloween. Loved the pumpkins used for the hidden object sparkles. I do not understand the negative reviews. There are those of us who just want to play the game for fun and relaxation, not to be challenged. Thank you developers for all of your hard work you put into this game and all of your other games. The details in the art work are excellent as well as the sound effects. Great job!! Rated 5 out of 5 by hopqueen from Perfect Halloween Game! I absolutely love this game! I might make this my go-to Halloween game for each year. The storyline is great, the graphics and level of detail are fantastic, and there are a lot of original types of games. • The storyline is a combination of mystery and horror, and while it's not a true horror game, it definitely has a couple of jump scares and a pretty scary bad guy! The mystery end of the story is SO GOOD. It's like reading an awesome mystery novel where you're absolutely sure you know whodunnit but you're wrong! I totally loved it. 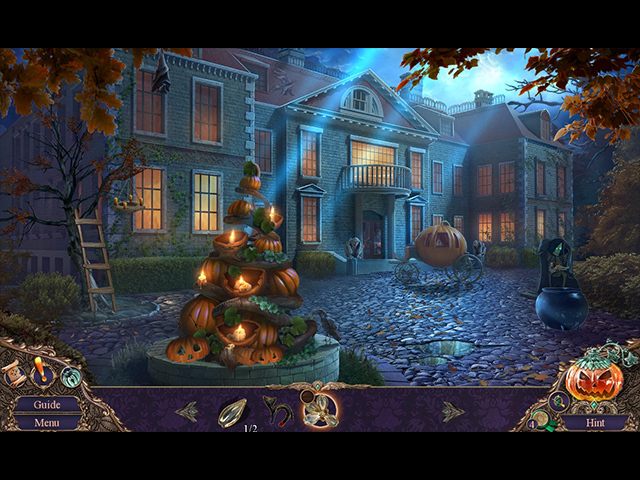 • The graphics are very clean and clear, and everything is dedicated to that great Halloween atmosphere. The dinner table is set with all kinds of cute pumpkin decorations, the costumes are beautifully done (and we get to pick our own costume! ), the house is decorated down to little dolls and ghouls on both the front lawn and all throughout the house. It really put me in the Halloween spirit! The details are immaculate and careful. Love it. • The games are clever and many times combine one or more typical types of games to create new, original ones. They also compounded games, like having one type of game that leads straight into HOP. I really enjoyed coming across these different surprises and looked forward to what else they could come up with, and they didn't let me down. These new twists on the usual games were peppered all throughout the game. 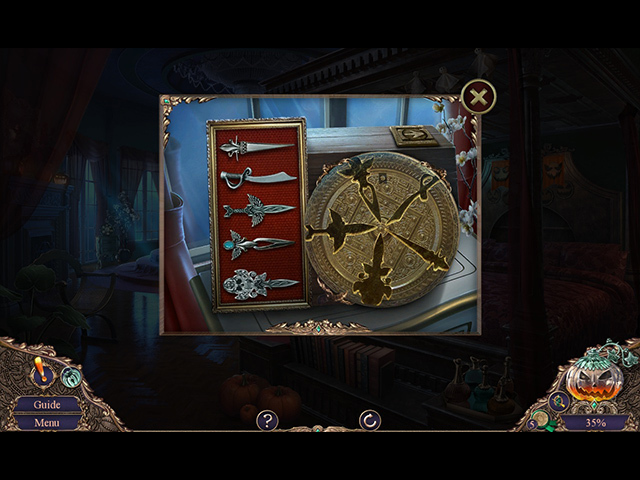 • As for collectibles, there is a witch in every scene and there are morphing objects in SOME hidden object scenes, so be wary! I think these are medium difficulty—you won't be searching forever but they're not just sitting right in front of you either. The only slightly "negative" thing I could say about this game with any conviction is that the characters' lips don't move when they speak, except for one (but the person who does this is a bit of a spoiler, so I won't tell you), and her lips move as if she was a real person—perfect. Overall, I love this game, if you couldn't tell already! If you're looking for a good mystery, something to get you in the Halloween mood, something with awesome detail and games that aren't the same as every other HOP, grab this! Rated 5 out of 5 by SparkleGlow100 from Mysterious, Ghostly & Spooky ! Wonderful game ! Review based on completed game and bonus game. Engaging story, lovely graphics, well done characters! Great background atmospheric music, reminiscent of the Harry Potter movie “Chamber of Secrets.” Spacious and grand. Characters present, but not in your face. Dark themed but not overly ‘evil.” More of a PG? If you choose “NO helpful messages,’ then you really won’t get any! Loved all the rooms in the huge manor, partially lighted and partially shaded. Lots of opportunities for “watery” effect scenes, which I loved. Water, fires, breezes…even crickets. It’s very well done atmospherically. A few of the scenes in the latter 1/4 of the game are a little less detailed, but I found it acceptable, because so many other rooms had great ambience. I like the fact that the instructions don’t automatically pop up for the puzzles, but you select the “?” if you want them. The puzzles were very interesting, but hard- so all you puzzle enthusiasts will be pleased. I liked the challenge. Bonus game equally enjoyable! Rated 5 out of 5 by Granny_Gruff from You'll Have to Try the Demo This Time - We All See Different Things! You play as Regina, Elliot's second wife. She is excited that they are finally going to have a party at their home - the house once shared by Elliot and his first wife, Caroline. Regina's twin sister, Marianne, arrives a day early to help with party preparations. Your housekeeper, Matilda, will also lend a hand. However, even before the party gets under way, things start to get a little twisted. Regina sees Caroline's image flicker across the glass doors in the hall and in her mirror. Then, during the party, Marianne disappears wearing your costume and the other guests also are MIA. What is going on here? Good stuff: I liked the HOPs and mini-games. The artwork was clear, beautifully colored, and the house was thoroughly decorated from the pile of Jack-o-lanterns in the front yard to the decorations in the bathroom. Along with the assorted CE bling, we will be looking for witches in each scene and morphing objects in some of the HOPs. Caroline puts in a ghostly appearance that I thought was well done, while the bad guy is definitely my idea of scary! Bad stuff: The opening animation is not as helpful in telling the background of the story as you might think. It implies that Elliot was devastated by Caroline’s death. But then reviewers seem to think Caroline blames him for her death. And two of the male characters, even in costume seem to be confused by the Devs and interchanged in one scene. Bottom line: I like mildly scary, as opposed to heart attack inducing blood chillers. I thought this game was scary but not nightmare-ish. Everyone seems to see something different here. so this is one time when you really need to try the Demo first. Will this be your appetizer to Halloween? Or the moldy pumpkin you find broken in the front yard? Rated 5 out of 5 by dollyflower from Happy Halloween Another great Halloween game for the season. I liked pretty much everything about it. I certainly can't agree with some of the negative remarks. The game is overall top rate!